Goodbye creamer, hello coconut oil? It’s true! Why try this new trend made popular by the founder of Bulletproof Coffee? Well, there are several compelling reasons. Coconut oil will amp up your energy kick even more than caffeine. The medium chain triglycerides (MCT’s) in coconut oil are easily and quickly absorbed by the body and rapidly metabolized to fuel you through your day. Fuel instead of fat storage? Sounds good to me! Coconut oil also speeds up metabolism and may help you shed unwanted pounds. Finally, coconut oil is known to boost immune function. It’s filled with lauric acid (read: healthy fats) which possesses potent antimicrobial properties. Make Bulletproof Coffee: Grab your blender! Add your brewed coffee plus one teaspoon of pure organic butter per cup. For your butter, I personally recommend Organic Valley's Organic Sweet Cream Cultured Butter, but you could use any kind as long as it's unsalted. Whiz to frothy perfection, and enjoy! Do you ever wonder how they make the chocolate harden over ice cream? As a kid I used to go crazy for a chocolaty treat called turtle shell. It's easy to make at home. Just melt some chocolate chips and and add coconut oil (you don't need a lot) and voila your chocolate syrup will harden when it is drizzled over the ice cream! Coconut oil is a multitasking wonder when it comes to your mane event. Say hello to your newest natural daily leave-in conditioner, deep conditioning treatment, growth stimulator, dandruff preventer, styling product, and sun protector. Not only can coconut oil do so many great things for your hair, it’s also 100% pure and free of the harsh - and potentially harmful - ingredients found in some hair care products. Daily leave-in conditioner: To moisturize and reduce breakage, warm a small amount of coconut oil between your palms and smooth through your hair, paying particular attention to the ends and shaft. Style your hair as usual. I recommend 1/4 teaspoon for short hair up to 1/2 teaspoon for long, thick hair. Use sparingly, especially on thin hair, as coconut oil can weigh hair down when too much is applied. Pro tip: for dry and/or damaged hair, add 1-2 drops of geranium essential oil to amp up coconut oil’s moisturizing effects. This ancient detoxifying habit is all the rage these days. Its origins can be found in the practice of Ayurveda, or traditional Indian medicine. Oil pulling has countless benefits to your oral health, including reducing bacteria and plaque, healing and strengthening your gums, and remineralizing your teeth. By detoxifying your mouth, oil also draws, or ‘pulls,’ out stored toxins, reducing your body’s overall toxic load. While Western medicine leans toward destroying bacteria on sight (hence your typical burning alcohol in mouth wash), Eastern tradition is counter-intuitive but more effective in this case. Oil is just a more attractive surface than your gums for germs, so germs get excited and hop on the oil party train! So when you spit the oil out, that pesky bacteria from deep inside your gums leaves with it. All this leads to a deeper, more long lasting clean. 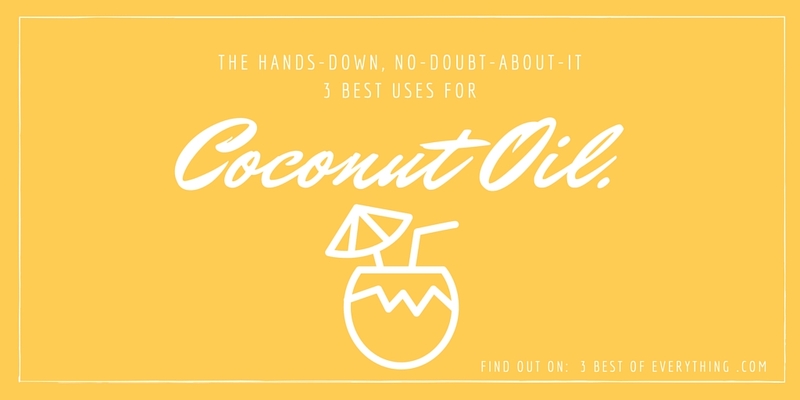 So, tell me… What’s your favorite use for coconut oil? Which one of our 3 Best are you going to try first?